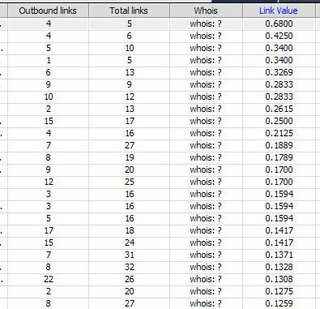 I’m doing some link analysis of some sites at the moment – that is, I’m trying to ascertain the value to client sites of links coming in from other web sites. are far more valuable than links from pages with not much content and that have tons of links leaving the page or the site. Now, the above won’t be any great surprise to search engine experts. But most people aren’t search engine experts. The tip: try and get links to your web site from sites that don’t have a lot of outbound links. And because the content of the page is relevant, it might even pay to write an article with a link or 2 over to your site and offer it to the web site you’d like a link from. Get more Google search engine info here and here.